Marshall McLuhan, one of the main pioneers of media studies, is most famous for his expression “the medium is the message.” His work, to be sure, is very difficult to comprehend; it is complicated. His writings on media are a combination of literary criticism, philosophy, historicism, and a utopian reading of media. Reading him, one can feel his excitement over the power of media to transform life as we know it. We can see that he is struggling to create a new language with new idioms to describe the transformations we are in the midst of in our “media age.” This struggle may still speak to us today since, in many ways, he anticipated a world in which we would live most of our lives through electronic media. In many ways, he anticipated facebook and twitter. He would see social media as an expression of what he called a “global village” – it, more than TV, brings out what he was getting at by many of his idioms that, to many people, seemed, utopian or even totalitarian. What I find most striking about this little book (without page numbers) is the fact that it sees the subject of this new media transformation as a kind of man-child and it finds that the best medium for educating the man-child to be humor. Everything is changing – you, your family, your neighborhood, your education, your job, your government, your relation to “the others.” And they’re changing dramatically…Innumerable confusions and a profound feeling of despair emerge in periods of great technological and cultural transitions. Our “Age of Anxiety” is, in part, the result of trying to do today’s job with yesterday’s tools – with yesterday’s concepts. Our time presents a unique opportunity for learning by means of humor – a perceptive or incisive joke can be more meaningful than platitudes lying between two covers. One needs to live in the “social drama” by way of the witty response which focuses on “means or processes rather than ‘substance’.” And instead of the “family circle” or the school being the basis of education, “character no longer is shaped by only two earnest, fumbling experts. Now all the world’s a sage.” This last pun, playing on Shakespeare, indicates that our new kind of education is, because of the media “buzz”…everywhere. Juxtaposing a picture of a young boy, McLuhan writes, in a section entitled “Your Neighborhood”: “you can’t go home again.” This section suggests that the child is, so to speak, abandoned to the endless time and space of the media. What is a child to do? Wouldn’t this provoke anxiety? What role does humor or wit play vis-à-vis this child’s new anxiety and homelessness? The “child” is an invention of the seventeenth century; he did not exist in, say, Shakespeare’s day. He had, up until that time, been merged in the adult world and there was nothing that could be called childhood in our sense. Today’s child is growing up absurd, because he lives in two worlds, and neither of them inclines him to grow up. Growing up – this is our new work, and it is total. Mere instruction will not suffice. What I find so fascinating about McLuhan’s comments about “today’s child” is the fact that he is describing a “man-child” of sorts (a schlemiel). His description rings an interesting note if it is juxtaposed to A.O. Scott’s recent New York Times Magazine article entitled “The End of Adulthood.” As I noted in a blog on Scott’s article, Scott finds it nearly impossible –with the sheer amount of films, TV shows, and young adult fiction (read my people in their 30s and 40s – for us to “grow up.” He sees this problem pronounced in Adam Sandler and Judd Apatow’s popular films. They pronounce the “end of adulthood” and a perpetual adolescence. If anything, the last words of Scott’s article – “get off my lawn”- show us that he has no solution. The shock of recognition! In an electronic information environment, minority groups can no longer be contained – ignored. Too many people know too much about each other. Our new environment compels commitment and participation. We have become irrevocably involved with, and responsible for, each other. This suggests that we recognize this “fact” and do something about it. However, there are many problems with this. Many people may see the news about this or that oppressed group in the world by way of this or that facebook feed, or even by means of humorous media such as The Daily Show or the Colbert Report (amongst others), but who takes this seriously enough to “commit” oneself or “participate.” Do we feel “compelled” to do something by virtue of a facebook feed or comedy episode? What happens when there is media indifference? When there is too much media? Perhaps it is the case that our inability to grow up (or rather our failure to do so), which Scott accuses us all of, has to do with the fact that though we feel responsible we don’t want to do anything. We’d rather not. After all, its easier to float around the media world which, more often than not, is full of humor. Unlike Scott, who argued that feminism has something to do with the “end of adulthood,” McLuhan suggests that the process of media is responsible for the latest displacement of adulthood. His answer is that we should respond to the media around us which “compels” us to “commit” ourselves and “participate.” Yet, somehow, this must be done with wit which, to his mind, is more mature than childish humor. This opens up many questions as to the distinction between the two. At the very least, he sees humor as the primary modality today for learning and action. Scott seems to see humor as incompatible. What’s the difference? 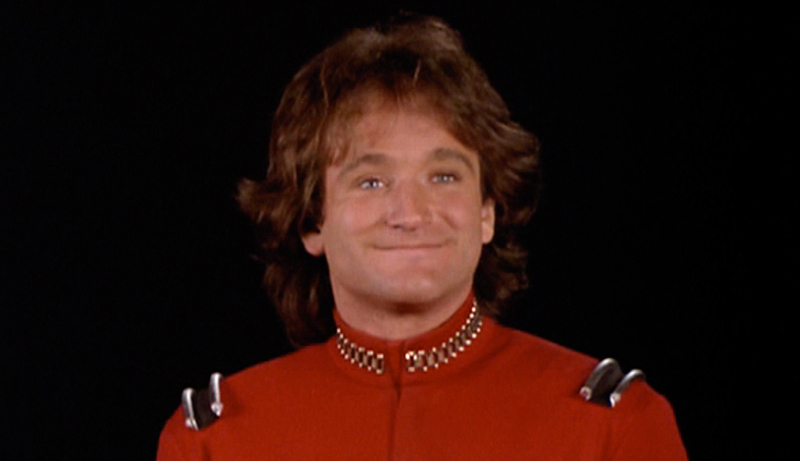 Today, a piece I recently wrote on Robin Williams entitled “On Innocence: Robin Williams and the Comedy of the ‘Little Man'” was published in Berforis, a wonderful Arts and Culture magazine. Here’s the link to the article. Take a look! I listened to Howard Stern on and off over the last ten years. Many of my close friends were avid listeners and they always made sure to let me know of something unusual about the show on this or that day. One of the most interesting characters on the show, who I remember hearing on several occasions, was Eric the Midget (aka Eric the Actor). He would call in to the Howard Stern quite often. He was a part of Stern’s “rat pack.” Howard, it seemed, was obsessed with Eric’s life and asked many questions about how Eric lived his life. In many ways, one could argue that Stern’s interest in “Freaks” expressed his interest in what it means to be human and in-common. In fact, this kind of argument was made by Leslie Fiedler in his book by that name: Freaks: Myths and Images of the Secret Self. At the outset of his book, written in 1978, Fiedler points out that the word “freak” has gone from being a negative name to an “honorific title by the kind of physiologically normal but dissident young people who use hallucinogenic drugs and are otherwise known as “hippies,” “longhairs” and “heads.” Such young people – in an attempt to perhaps make clear that they have chosen rather than merely endured their status as Freaks – speak of “freaking out,” and, indeed, urge others to emulate them by means of drugs, music, diet, or excitement of gathering in crowds”(14). However, Eric was a real midget. He didn’t choose to be a “freak.” And he didn’t think of himself as a “freak,” either. Howard treated him as he would treat many people on the show. And like Leslie Fiedler, Howard may have seen something in Eric that he saw hiding in himself. He identified with him although, in many ways, he tried to retain his distance. Given his final words, we can see that Fiedler would likely find the difference between himself and Eric effaced. He would come to terms with the other. But now…it’s too late. And we must mourn our loss. Eric died today at the age of 39. To give you a sense of who he was and how Howard related to him, I’m going to post a few clips. And here was a recent show…. As Fiedler might say, Eric was one of us, yet, at the same time, he wasn’t. This difference and its limits were traversed by Howard Stern for well over a decade. And we have yet to go through all of the footage and to figure out what happened and what this all means. Because of Stern, Eric the Midget (Eric the Actor) was heard by millions of listeners who otherwise wouldn’t give him a second glance on the street. He was on Stern right to the very end. And Howard, ultimately, didn’t want to exploit him. He wanted to make his life better and gave him the stardom that Andy Warhol believed all Americans deserve. One wonders how this anticipates facebook and twitter: mediums that “interface” different people who exchange information but never really touch. And it does seem as if there is a code of separation which rules over all of our relations. Baudrillard laments this and mourns the death of the “face-to-face” contact and action. The problem with this, of course, is that it suggests that all bodily relations are “interfaced.” This suggests that Levinas is wrong and that we cannot be “persecuted” or “traumatized” by the other. In this hyperreal world, we can interface with the other and keep our distance; we need not be obligated by them. The only thing that affects us is the information that passes through us and keeps us and all things separate. The only reason we are concerned about our bodies is because “everyone is made to concentrate” on the body, “not as a source of pleasure,” but “as an object of frantic concern, in the obsessive fear of failure or substandard performance, a sing and an anticipation of death, that death which not one can any longer give a meaning, but which everyone knows has at all times to be prevented”(35). The comedy, it seems, for Baudrillard is not to be found save for the fact that we are caught up in too many surfaces and interfaces. We live for the ecstasy of the network. But we fear, too often, that we have missed our cue. As Paul Celan says in one poem, we are adrift in a sea of relations. And these relations often blur into each other making our relations more confusing. For Baudrillard this can only go in one direction: toward a kind of Apocolypse of all history and all meaning. This is the fatalist reading. And it all starts in Disneyland where we all become infantile and, for Baudrillard, where we lose all sense of an adulthood that once was. In his world, the Levinasian face-to-face is a thing of the past. In the hyperreal, we all become children who know only interfaces and not faces. One of the most interesting confluences between German Romantic conceptions of humor and a certain thread of Jewish-German Philosophy is the obsession with time, immediacy, and illumination. The two seem like odd bedfellows since, after all, religion is a serious affair and humor, as a matter of course, is not. The witz, like revelation, is a surprise. And, like a comedic audience, the religious community must be ready for the lightning delivery. Illumination is the punch line. Franz Rosenzweig, in The Star of Redemption, often talks about Revelation in terms of immediacy and suddenness. God’s command to Love Him is an act of urgency and immediacy and it gives birth to the soul. It is born out of its immediate response to its Creator which calls on man to respond to His call. There is one recipe alone that can make a person Jewish and hence – because he is a Jew and destined to a Jewish life – a full human being: that recipe is to have no recipe…Our fathers had a beautiful word for it that says everything: confidence. In other words, a Jew must always be ready for surprises. One must be prepared. The lived moment leads directly to the knowledge of revelation, and thinking about birth leads indirectly to the knowledge of creation. But in his personal life probably not one of us will taste the essence of redemption before his last hour. And yet here, too, there is an approach. It is dark and silent and cannot be indicated by any means, save by my asking you to recall your own dark and silent hours. I mean those hours in the lowest depths when our soul hovers over the frail trap door which, at the very next instant, may send us down into destruction, madness, and suicide at our own verdict. Indeed, we are astonished that it has not opened up until now. But suddenly we feel a touch as of a hand, to let us draw up out of the darkness. This is redemption. Buber and Rosenzweig’s obsession with immediateness and being ready suggests that we be ready for a surprising Blitz-of-illumination. And in a sense the comedian, like a prophet of sorts, must also be ready to not just deliver a joke at lightening speed but for an explosion of humor. As Nancy suggests in his reading of the German Romantic concept of the Witz, there is a kind of immediacy that humor shares with mysticism. In the wake of reading Nancy, when I read these lines from Buber and Rosenzweig, I could not help but think that they want everyone to be ready for the Witz. For them the Witz is a spiritual Blitz, not a secular one, as it is for the comedian. Perhaps comedy, for the German Romatnics, offered what Benjamin would call a profane illumination….in the Blitz of the Witz? To be sure, Benjamin, following Charles Baudeliare, would call that the “experience of shock.” Moreover, Benjamin, at the end of an essay on Surrealism spells out the relation of Revelation to time when he argues that experience today, if it is to be revolutionary, must be a like a clock whose alarm goes off every second. The only problem with this, however, is that it leaves no time for the delivery of the joke. It may be fast but it takes time to reach the audience. Immediacy needs mediacy. The Blitz needs the Witz. And whether it’s the Jewish-German Philosophical approach to Revelation or the German Romantic approach to comedy it seems that both believe the audience needs to be ready for surprises. And, as Rosenzweig and Buber seem to have believed, that’s the crux of being Jewish. There’s nothing like a simple sentence and a simple message. And then again, some people love to be obtuse. When we let them, some people just don’t know when to stop. People like to yap; especially academics. Once in a while, I dare myself to open up a book from the 1990s by this or that thinker who wanted to write like Jacques Derrida. I knew a few of them. They wanted to write and speak like him but, since they were American, they wanted to be daring and mimic him with an American accent. What would sometimes happen, however, was a language that went on and on without style – in short, American Philosophical Ramblings from the 1990s – APR90s. Here’s another sample from another author. He writes on madness, not in a mad way, but in a note-taking kind of way. He write-jots. And, after a while, this rambles. (Don’t get me wrong though, I love madness just like anyone else, but what happens when madness is communicated by way of the write-jot? The relation of madness to reason seems one of oppositions, at least in Descartes; against the plain truth of facts, “they” persist in their follow; madness against reason. We equate madness with unreason even as reason evinces its own madness. This madness, belonging to reason, seems worlds apart from madness “itself,” though Foucault speaks of such a madness, of a madness “before” reason’s regulation: “We must try to return, in history, to that zero point in the course of madness in which madness is an undifferentiated experience, a not yet divided experience of division itself”(Madness and Civilization, p. ix). How, Derrida asks, may we confront this “zero point” of madness, madness itself? How can we think this zero as a confrontation with madness, with its monstrosity, represent our greatest achievement, however, impossibly. Do we, in reading this write-jot, experience the “zero-point” of “madness” and “monstrosity”? I’m not so sure these APR90s knew this. But, I may be wrong. Maybe they knew that they were rambling off monstrosity which, of course, cannot be thought. But can it be said? The only way to know is to ramble on, and as you ramble, who knows, maybe you can experience the “Zero point” of “madness” and “monstrocity.” Now: is that funny or what? Nu…It’s Quiz Time! 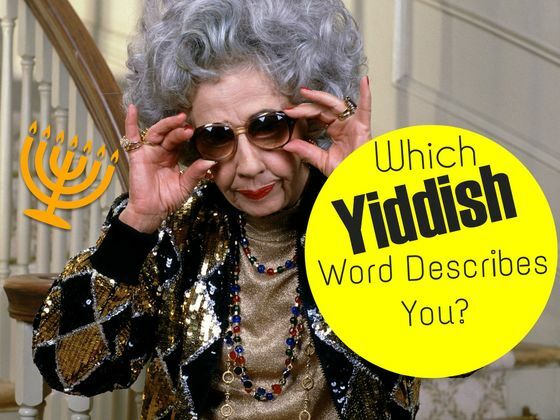 Which Yiddish Word Describes Your Personality? Schlemiel? When it comes to quizzes on facebook, I often pass them by. But I’ll have to admit that I came across a recent facebook quiz that drew my attention. While I’m not interested in what philosopher, artist, or actor I most resemble, I am interested in a kind of quiz that would let me know whether or not I’m a schlemiel. In fact, I’ve always been interested in whether I or any of my friends would be dubbed a schlemiel. I’m not alone, however, in my interest. To be sure, when I tell people that I write on the schlemiel, they often do three things: 1) they ask for a definition of the schlemiel; 2) they ask me if I’m a schlemiel; and then they ask me if 3) they are schlemiels. In a sense, I am the one who is often asked to give a quiz on the schlemiel the minute I’m asked about what I do. When I took the quiz, I could see that there may be a pattern of answers that would lead it to dub a person a schlemiel. I saw questions that asked what kind of film I liked most, so I chose “Annie Hall.” When it gave me several options as to what Jewish comic character I identified most with (and most of the characters are from Seinfeld) I chose George, the prototypical schlemiel of the show. Moreover, I chose things that I thought a schlemiel would choose. But in the end, to my chagrin, I learned that the word that best fit me was…mensch. However, is it really so bad to be a mentsch? I wondered what I had done wrong, after all, I am a schlemiel theorist. What went wrong? The way I read this witty observation is that it says a lot for humility. In fact, that makes sense when we are talking about schlemiels in the Yiddish tradition. Most of them don’t think of themselves as schlemiels and many of them, because they are so sincere and caring, are like mentsches. Daniel Boyarin, in his book Unheroic Conduct: The Invention of the Jewish Male, suggests that a mentsch is simply an effeminate male who cares for and often takes care of others before he or she takes care of him or herself. This sounds a lot like I.B. Singer’s proto-schlemiel, Gimpel. He trusts people and wants to help them. But he is betrayed. Perhaps the only difference between Boyarin’s ideal mentsch and Singer’s schlemiel is that Singer knew full well – in the wake of the Holocaust – that in a world filled with evil and deception, maybe the mentsch is the real schlemiel. And the irony is that we need to change, not the schlemiel. That said, this schlemiel-want-to-be-who-may-really-be-a-mentsch would love to find out if anyone who has read this post and taken this test has been dubbed a “schlemiel.” If so, let schlemiel theory know. We’d like to find out, by way of trial and error, what magic combination of choices will yield a schlemiel. Please let me know! Have fun! Just yesterday, I was astonished to see two articles – one from The New Yorker and one from The New York Times – that focus in on the man-child as the norm. And both of them ask when this happened. In response to The New Yorker article, which is entitled “The Awkward Age,” yesterday, I wrote a blog/essay. And today I’d like to write on the New York Times article which is entitled “The Death of Adulthood in American Culture, which is written by the celebrated film critic A.O. Scott. What both of these articles share is in interest in when things started to change. They both ask: when did America start becoming “awkward” or “childlish”? The author of The New Yorker essay argues, against Adam Kotsko – who wrote an intelligent book called Awkwardness – that the beginning of the “age of awkwardness” was not the 60s –when traditional values were radically put into question – but after 9/11. But, as I pointed out in my blog piece, the author of the essay needs to understand Kotsko’s philosophical and sociological approach to awkwardness before she can understand his periodization. Regardless, it’s interesting how, if we look at the dates of the above-mentioned scholarly works, the merger of the schlemiel with American culture are all dated before 9/11. In suggesting that patriarchy is dead, I am not claiming that sexism is finished, that men are obsolete or that the triumph of feminism is at hand. I may be a middle-aged white man, but I’m not an idiot. In the world of politics, work and family, misogyny is a stubborn fact of life. But in the universe of thoughts and words, there is more conviction and intelligence in the critique of male privilege than in its defense, which tends to be panicky and halfhearted when it is not obtuse and obnoxious. The supremacy of men can no longer be taken as a reflection of natural order or settled custom. However, Kotsko gives this “end” a different, more positive valence. To point out what has happened as a result of the end of patriarchy and the end of adulthood, Scott notes that “nearly a third” of the books for “Young Adult readers” are read by men and women between the ages of 30 and 44. Full disclosure: The shoe fits. I will admit to feeling a twinge of disapproval when I see one of my peers clutching a volume of “Harry Potter” or “The Hunger Games.” I’m not necessarily proud of this reaction. As cultural critique, it belongs in the same category as the sneer I can’t quite suppress when I see guys my age (pushing 50) riding skateboards or wearing shorts and flip-flops, or the reflexive arching of my eyebrows when I notice that a woman at the office has plastic butterfly barrettes in her hair. God, listen to me! Or don’t. My point is not so much to defend such responses as to acknowledge how absurd, how impotent, how out of touch they will inevitably sound. In my main line of work as a film critic, I have watched over the past 15 years as the studios committed their vast financial and imaginative resources to the cultivation of franchises (some of them based on those same Y.A. novels) that advance an essentially juvenile vision of the world. Comic-book movies, family-friendly animated adventures, tales of adolescent heroism and comedies of arrested development do not only make up the commercial center of 21st-century Hollywood. They are its artistic heart. Should we mourn the departed or dance on its grave? What sticks out most, according to Scott citing Fiedler, is the American fictional character’s “innocence and instinctual decency” which are “juxtaposed with the corruption and hypocrisy of the adult world.” And, here we should note, the schlemiel has much in common with these kinds of motifs. Like the American fictional character, Sholem Aleichem and Mendel Mocher Sforim’s characters also have an “innocence and instinctual decency” which is “juxtaposed with the corruption and hypocrisy of the world.” For this reason, when I.B. Singer’s “Gimpel the Fool” was translated by Saul Bellow and first published in The Partisan Review, in the early 1950s, was a hit. And Singer went on to be a celebrated Jewish-American writer and a Nobel Prize winner. The reason: Gimpel is nearly identical with the American fictional character, as described by Fiedler. Scott argues that this American fictional figure is translated into novels in the 60s and 70s about “wild, uncivilized boys” who rebel against authority and express “youthful rebellion.” Scott takes this thread and argues that it is but a “quick ride” to Hollywood which, eventually, ends up in Apatow’s films that celebrate perpetual adolescence. But the antics of the comic man-boys were not merely repetitive; in their couch-bound humor we can detect the glimmers of something new, something that helped speed adulthood to its terminal crisis. Unlike the antiheroes of eras past, whose rebellion still accepted the fact of adulthood as its premise, the man-boys simply refused to grow up, and did so proudly. Their importation of adolescent and preadolescent attitudes into the fields of adult endeavor (see “Billy Madison,” “Knocked Up,” “Step Brothers,” “Dodgeball”) delivered a bracing jolt of subversion, at least on first viewing. Why should they listen to uptight bosses, stuck-up rich guys and other readily available symbols of settled male authority? The bro comedy has been, at its worst, a cesspool of nervous homophobia and lazy racial stereotyping. Its postures of revolt tend to exemplify the reactionary habit of pretending that those with the most social power are really beleaguered and oppressed. But their refusal of maturity also invites some critical reflection about just what adulthood is supposed to mean. In the old, classic comedies of the studio era — the screwbally roller coasters of marriage and remarriage, with their dizzying verbiage and sly innuendo — adulthood was a fact. It was inconvertible and burdensome but also full of opportunity. You could drink, smoke, flirt and spend money. The trick was to balance the fulfillment of your wants with the carrying out of your duties. I’m all for it. Now get off my lawn. By ending on this note, we can see that Scott is not happy with what Itzkovitz would call the “new schelmiel.” And while he understands that the “boyish” man-child is a central American literary tradition, he doesn’t know what to do with this history. His appeals to Lenny Bruce echo the reading of Lenny Bruce made by David Biale in his book Eros and the Jews. But, as Biale notes, these two figures – the schlemiel and the rebel – are what we are left with. Nearly 20 years after Biale notes this, it seems that Scott sees the battle as over. After all, as Scott says, “Adulthood is dead” and now “the world is our playground.” His last notes are comic, but bittersweet. And they give us the answer to the question he posed above: he is going to mourn the death of adulthood while we, it seems, will dance on the grave. But as I look to show, in my forthcoming posts on Adam Kotsko’s Awkwardness and my reflections on the schlemiel, one can read this turn to perpetual adolescence in a different manner. Last year I read Adam Kotsko’s Awkwardness: An Essay. I put it on the backburner as something I would write about in the near future because, quite frankly, Schlemiel Theory has been busy with several different philosophers, books, and comedians over the last year. That said, when a friend of mine tagged me in a post on facebook today – about an article written in The New Yorker entitled “The Awkward Age” – I felt I had to, at the very least, read the article and comment on Adam Kotsko’s book, which is referred to in the beginning of the article. While the article is not that interesting, Kotsko’s philosophical, sociological, and historical approach to the phenomena of awkwardness is. His “essay” suggests a few possibilities for schlemiel theory that may or may not be of interest because they tap into philosophical and historical approaches to one of the most notable features of comedy today: awkwardness. As the Eskimos were said to have seven words for snow, today’s Americans have a near-infinite vocabulary for gradations of awkwardness—there are some six hundred entries in Urban Dictionary. We have Awktoberfest (awkwardness that seems to last a whole month), Awk and Pshaw (a reference to “shock and awe”), and, perhaps inevitably, Awkschwitz (awkwardness worthy of comparison to the Holocaust). We have a hand signal for awkwardness, and we frame many thoughts and observations with “that awkward moment when…” When did awkwardness become so important to us? And why? In “Awkwardness: An Essay” (2010), the critic Adam Kotsko dates our age of awkwardness—embodied by “the apparently ontological awkwardness of George W. Bush” and manifested in television shows like “The Office,” “Arrested Development,” and “Curb Your Enthusiasm”—to the early aughts, with a postwar prehistory. (In short, Kotsko writes, the fifties purveyed capitalism into an ideology of “traditional Christian values”; in the sixties, these values were destabilized by the counterculture movement; the ideological vacuum of the seventies led to the paranoia and nihilism, reflected in the metaphysical being of Woody Allen; in the eighties, pure capitalism became its own value system, sustained by opposition to the Soviet Union; and in the nineties nihilism returned, minus the Cold War paranoia, inaugurating the age of irony. What caused the shift from irony to awkwardness? Interestingly, Kotsko refuses to blame September 11th, connecting the end of irony less with “a culture-wide turn towards earnestness and patriotism” than with irony having “simply exhausted itself.” My feeling, however, is that we can peg the end of irony to September 11th precisely because of the failure of “earnestness and patriotism” that Kotsko describes. We finally had an “evil opponent” again. Terrorists, like Communists, hated “our way of life.” If we neglected our Christmas shopping, Bush said, the terrorists would win. But, this time, the rhetoric didn’t stick. The U.S.S.R. had been a nuclear superpower, with geopolitical aims comparable, if opposed, to those of the U.S. Al Qaeda was nationless, nihilistic, and armed with box cutters. You couldn’t lump it together with North Korea and call it the Axis of Evil—that didn’t make sense. The problem with this hasty overview and application of his book is that it doesn’t explain the basis of Kotsko’s reading of awkwardness vis-à-vis philosophy and suggests that Kotsko’s book simply historicizes awkwardness. This is incorrect and misleading. Yes, the “age” we are living in may be awkward, as the author suggests, but she doesn’t understand why and neither does the reader. To understand how he historicizes awkwardness, we need to first understand the philosophical basis for his project. Kotsko turns to Martin Heidegger and then Jean-Luc Nancy to explain the philosophical basis of awkwardness. Regarding Heidegger, Kotsko notes how the “most fundamental mood” that Heidegger “examines in the context of Being and Time is anxiety”(12). Through this mood, Dasein (being-there, man) has a “special window onto a question that he pairs with that of the meaning of being: namely, the questions of time”(12). When a person “dwells” in a “mood of anxiety” he or she experiences “time” as an “existential urgency”(12). Besides being interested in anxiety and its relation to time, Kotsko is also interested in Heidegger’s treatment of another mood; namely “boredom”: “Whereas anxiety provides special insight into the question of time, boredom bears specifically on the question of how humanity is related to animal life”(12). Drawing on Heidegger, Kotsko notes how boredom – like anxiety – brings out what is “truly distinctive about humanity” since it enables us to be “detached” from “an amazing array of stimuli” (or what Heidegger would call the world). This detachment is what Heidegger would call transcendence. From here, he notes how, for Heidegger sees anxiety as a more “fundamental mood” than boredom because the mood of boredom is still too connected to the world. While boredom is a “breakdown in our normal relationship to the world…anxiety points toward the ultimate breakdown of death”(14). In other words, Kotsko is interested in how awkwardness is a contagious kind of mood. Other people, in relation, can catch it (as it “spreads”) can become awkward. With a definition like this, how can one say that our post 9/11 age is the most awkward one of all as the writer from The New Yorker suggests? With this philosophical and sociological kind of basis, one can argue that any age that is transitional will be awkward. What follows is a sociological exercise. Since the 1960s challenged, traditional values the norms changed and America had a hard time adjusting. He discusses changes in terms of civil rights, sexuality, experimentation, and nihilism. Woody Allen, according to Kotsko, emerged as “one of the pioneers of awkwardness” in the 1970s because of this radical social upheaval. And even though things changed in the 1980s because of the Regan Era (which looked to reestablish tradition and norms and “overcome awkwardness”) the 90s, which marks a fall back into instability, gives us Seinfeld. But, argues Kotsko, “none of the main characters actually sit and stew in their awkwardness, and I’d propose that that’s because they are all essentially sociopaths. They cause awkwardness in others but don’t truly feel it themselves, because they lack any real investment in the social order – instead they merely attempt to manipulate it”(23). The only exception to the Seinfeld rule is the schlemiel, George: “His sheer patheticness and vulnerability, his lack of the steady income and social status of Jane or Elaine or the strange self-assurance of Kramer, keep him from being completely detached”(23). In other words, he is awkward because he is not successful in a context where others are. Kotsko calls this “the promise of awkwardness”(26) and argues that “for all its admitted perils and difficulties, awkwardness does contain a seed of hope”(26). To be sure, Kotsko, who does much work in Continental Philosophy, is familiar with Karl Marx, Ernst Bloch, and Walter Benjamin who all discuss hope and its relation to opposing the status quo. He is no doubt drawing on this trend by claiming that the mood of awkwardness is a “seed of hope” and a “promise.” It is not merely a term to describe the “age” we are it – as the writer from The New Yorker suggests. Kotsko spells it out at the end of his first chapter: “More than describing a cultural trend, then, my goal here is ultimately to point toward what we’re all already hoping for”(28). What Kotsko means by this is that the mood of awkwardness – suggested by Apatow films and…in general – is a messianic or utopian kind of mood that anticipates living in a world where “we might be able to simply enjoy one another without mediation of any expectations or demands”(26). Does Big Bang Theory also project this hope? Is Seth Rogen a messianic figure? If we are to live perpetually in a kind of childhood state, as Apatow’s films suggest, we will be in a perpetual state of awkwardness. And this anticipates, for Kotsko, a messianic state of not living up to an ideal and being an adult. The suggestions that Kotsko makes about our age have to do with the collapse of norms that we can maintain by not wanting to return to tradition or anything normative. It’s better to just figure out our-relation-to-each-other as we go along. I find this proposal to be very interesting because it suggests something we see with the schlemiel who is often portrayed as an innocent, naïve, and awkward character. In fact, all of the characters that Kotsko looks at could be called schlemiels.